The Lakshmi Devi Temple is one of the earliest known temples built in the Hoysala style. The Lakshimi Devi temple is located in Doddagaddavalli, a village in Hassan District of Karnataka state, India. It is located 16 km from the district capital Hassan and lies on the Hassan city - Belur highway. 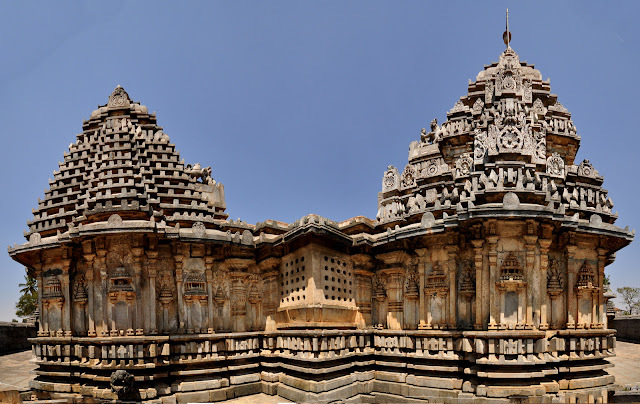 The town's main attraction, the Lakshmi Devi temple, was built by the Hoysala Empire King Vishnuvardhana in 1114 C.E. Here are some of the panoramic pictures of the temple. Click on the pictures to enlarge them. The 4 shrine complex looking South East. Kadamba Shikara with Kalasa on top. Looking West. The compound wall and the shikaras looking North. Rear view from the western bank of the Doddagaddavalli kere. The temple is on the western bank of this lake and this lake has dried up for the first time.